Thinking of you and the times we had there. I wish I could go back and be with you again. I’ll banish lonesome thoughts but they’ll return again. Walking with you by this cold Atlantic foam. Zu diesem Song von Andy Irvine hat der Journalist Christoph Dieckmann einen lesenswerten Artikel in der Wochenzeitschrift "DIE ZEIT" veröffentlicht. Titel: Der Mönch am Meer. 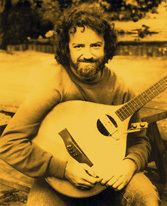 Noch mehr über und von Andy Irvine.